“In The Year 2525” is a Science Fiction story that takes place in the 26th Century and stands as one possible outcome based on past and present real-world events that will indelibly shape our future. It combines raw humor, attitude, action and whimsical light-hearted moments (including the occasional 80s reference) with a bit of humanity’s more serious long forgotten history. The historical information used in this novel is based on real-life documents, empirical evidence and recorded testimonies pertaining to paranormal experiences, including but not limited to: sightings, alien abductions and demonic possessions. Over the past few decades governments, military and religious factions around the world have disclosed classified information to the public as they begin setting the world stage for a major life changing event. From the reader’s point of view, this information will be revealed through the eyes of the story’s main character, Irene Jameson, who will discover the answers to some of humanity’s longest unanswered questions: Who are we? Where did we come from? Why are we here? From ancient cave paintings to the discovery of ancient structures on the moon, actual historical references have been researched and their results compiled to create an entertaining and educational Sci-Fi Novel designed for an audience who may otherwise be unaware of — or uninterested in — the fact that humanity does indeed have an untold history, one that not only shaped our civilization here in the present, but one that will continue to shape the civilizations of the future. That is of course if by the year 2525, man is still alive. The story begins on June 18th, 2523 as the United States West Coast Metroplex experiences an early onset of a phenomena known as “Earth Changes”, a belief that the world will enter a series of cataclysmic events causing major alterations to life on the planet through a series of natural events such as earthquakes, pole shifts, and solar flares; events that will make a significant impact on social, economic and political systems across the world. With the sun’s unusually high activity triggering major earthquakes along the Earth’s “Ring of Fire”, this technology dependent society stands on edge as it experiences for the first time in over a century sudden blackouts, disruptions rendering technology useless, and network outages creating havoc throughout the Automated Traffic Control Systems impacting all areas of society from transportation to the financial sector. As panic mounts, evangelist Mary Camping takes to the streets with a strong anti-science, anti-technology, pro-God movement that begins to take root across cities throughout the country, and it was her accurate prediction on today’s events that has earned her the credibility to gain support for this movement. Her latest prediction reveals that rapture will occur soon in the coming years, a message that causes a major social shift towards religious interest. Meanwhile tensions between the world’s two opposing super powers, The United Nations (UN) and The Coalition of Red States (CORE), put the world on the brink of conflict after the Coalition makes a major military move on and off the planet and accusing the UN’s Space Corp of weaponizing the sun after a solar flare had destroyed a high value military operation on Venus, a strike the Coalition considers to be an act of war. Irene Jameson, a college graduate on her way to joining the Space Corp Academy at the City of Earth, spends her last day on Earth running errands with her kid sister Charlene. Over the course of this day Irene encounters several occurrences of an identity mismatch as bio-scanners, which are used to authenticate people through the Civil Database during transactions, identifies her as her late mother Miranda Jameson. These bio-scan mismatches, which should be an impossible occurrence, will lead Irene to a locker at a storage facility which is registered under her mother’s name, an account that has remained active even after her death. With Irene’s ability to pass as her mother, she finds this mystery locker and its contents. What she finds, both amazing and startling, takes her on a long path of discovery to unlock the truth behind man’s hidden history. I am working on art for my Sci-fi novel. So far I only got the main character, but I hope to use her as a template for the other female characters. Eventually I’ll work towards creating male characters and then other world-objects from the novel. I am doing all of the rendering under Cycles using Toon BSDF and Freestyle. I don’t have a completed body yet (missing hands and feet) with this current model as I have recreated the model from scratch a week ago. When I was learning how to use Blender through the online tutorials, I was under the impression that more vertices would have made a much smoother model, but as it turned out for what I was trying to accomplish, it didn’t look as smooth as I wanted under toon conditions and was a nightmare trying to manage so many vertices. On top of that it slowed my PC down significantly in the view-port, so the model is now about 1/10th the actual size (file size and vertex amount) it used to be and ended up looking better. The light and shadows with toon I think turns out nicer. A much older version of the model (July 2013), I was testing an emission plane in Cycles before I decided to keep it all with Toon BSDF. 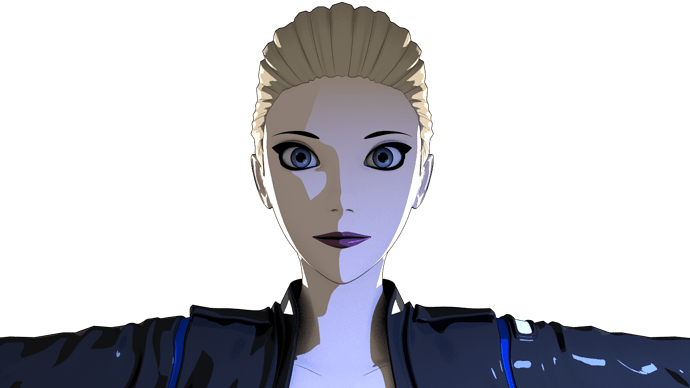 Her hair colors changes often, and it has to do with the character’s preferences in the novel along with the technology she uses to make it possible (VaniTech). Her real hair color would be blonde, but her trademark color is Cobalt Blue. How do you combine cycles and freestyle? 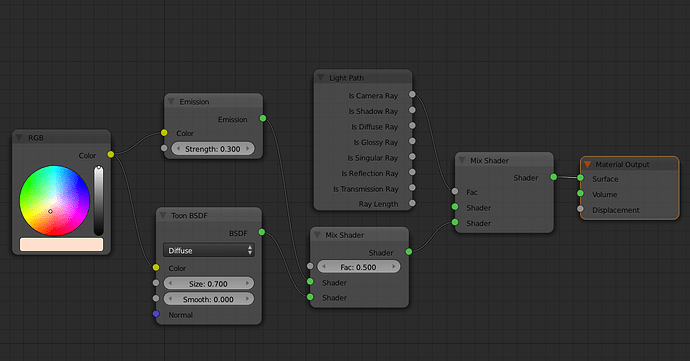 i suppose you do 2 renders, one BI and one cycles and mix them in the compositor? Your topology is really great! In Internal, I check off all Layer Includes except for Freestyle so I can get transparent lines. Then in Cycles using the Compositor, I created the two Render Layers nodes, one for Cycles and one for Blender Internal, mixed them with the Alpha Over node before going to the Composite node. Takes a bit longer to render due to Freestyle (and can sometimes crash during a render), but the end results are what I wanted. I used to do one layer at a time and combine in Photoshop before learning that. Thank you for the tip. I was trying to figure that out the first time I did the turntable, the slowing down before looping again was giving me a headache and I couldn’t figure it out! I’m impressed. This is quite amazing. I love this kind of cartoony model. 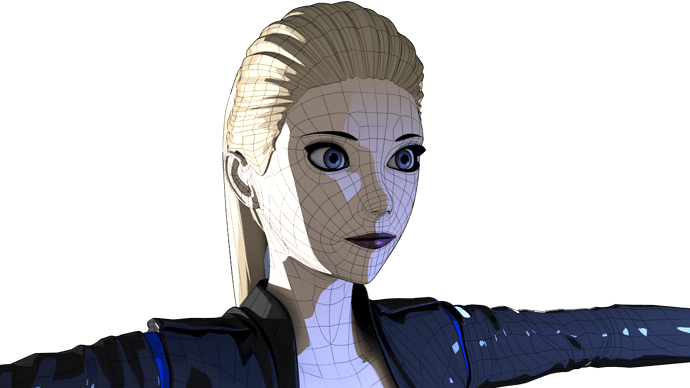 I’m new to the world of 3d models, but I hope one day I can model a girl as beautiful as yours. I’ve worked on this model since January of this year, and nothing else. Most of it was just learning how to use Blender, with about 50% modeling, 30% materials and the rest just trying to figure out rigging, weight painting and all the little headaches that went into this. 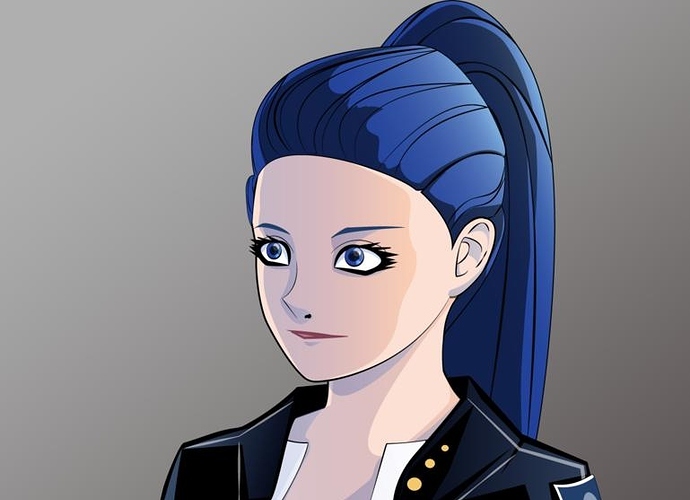 Regarding the blue hair color, I was trying to create my own anime style so I used one of the more recognizable parts of anime: unrealistic bold hair colors. As such, I had to create a technology in-story to explain how it was achieved. Eventually this technology becomes an useful/important part of the story. The character prefers cobalt blue, hence the color in some of the old renders. Over time, I had actually toned the blue down since the older renders above, I started to unlike the bright blue myself. Well, I can say that cobalt blue suits her better than the standard blue. Have you tried rendering other colors in her hair yet? Maybe even multiple-color hair? 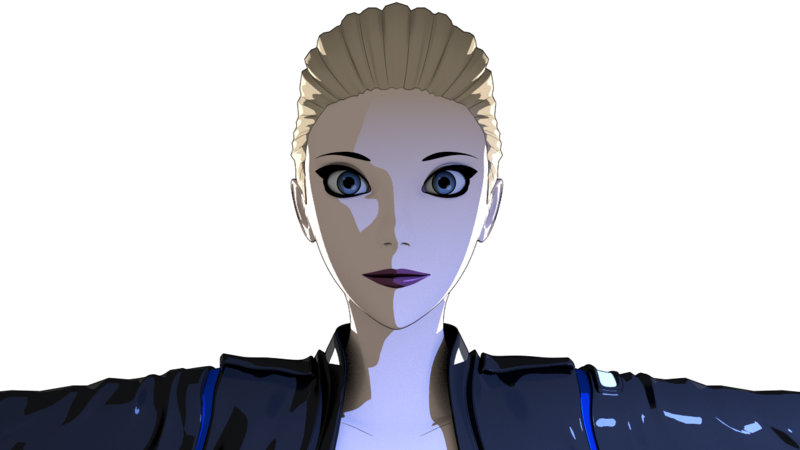 I haven’t rendered any of the other hair effects yet, just her natural blond and her signature blue – plus she’ll use different hair styles on occasion. For now, I’m just trying to get the model fully completed before getting distracted with any of the aforementioned details, but I do model things for forward thinking purposes such as the above. 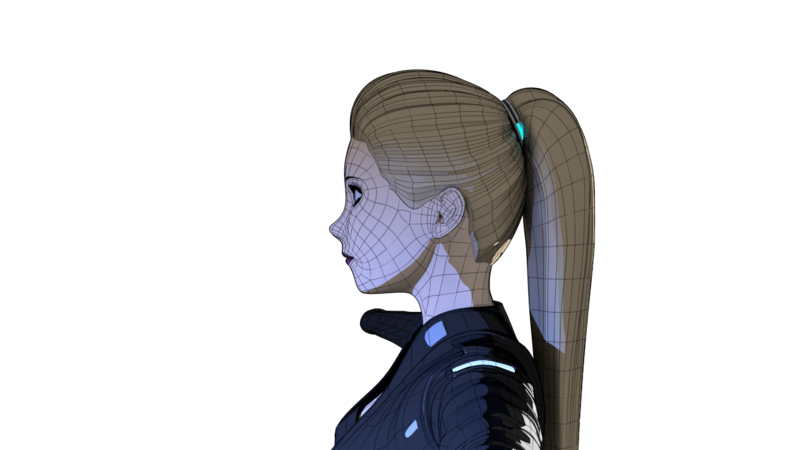 In her universe (the 26th Century), technology can support hair effects such as full coloring, shaping (anime defying physics), texture, glowing strands and animated effects without any damage to the natural hair. 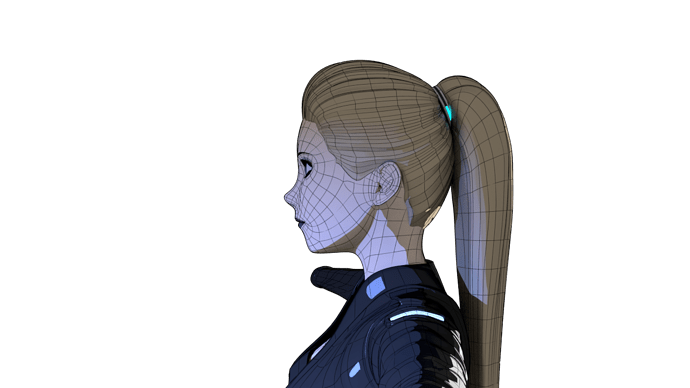 It’s done by applying a gel-like substance that bonds to the hair strands (diffuse and light emitting nano-tech), and a controller device attached to the hair – as seen in the hair band in the side view posted above. Commands are sent to the controller from an external programming device. This is something I want to animate at some point, once I get there. Story-wise, I was inspired by the digital nail-polishing scene in Total Recall, so I created an entirely fictional product that handles hair and make-up for people in my own story that make use of it, such as the main character. 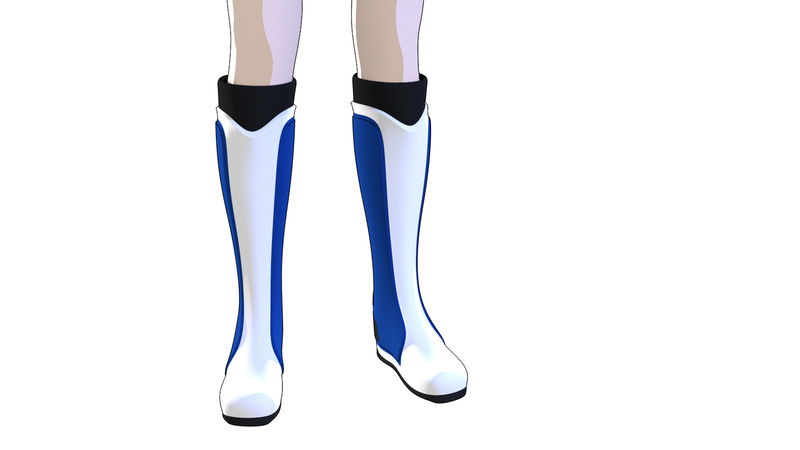 I remodeled the entire model in a much simpler low poly version, which seems to work best with the anime-ish style I am going for. 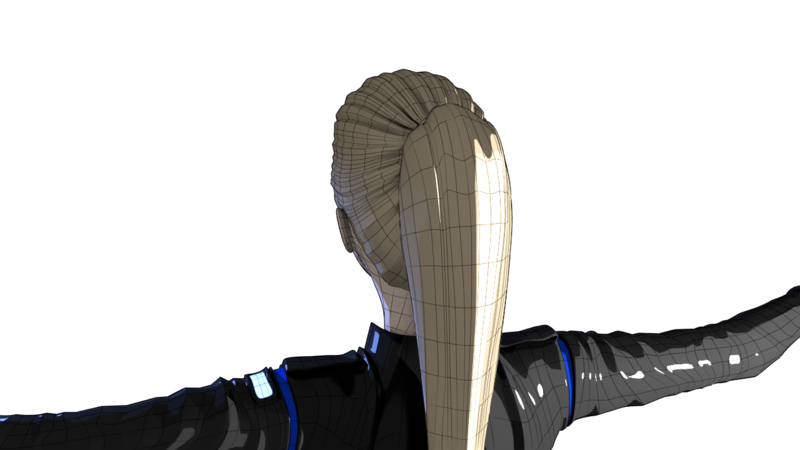 I’m having major issues rigging this however, I can’t get the shoulders to deform nicely in multiple angles/directions. shoulders: I have the same issue with my models, impossible to have decent rigging of the arms! Maybe you should use corrective shape keys. The rest position is also important, do not use extreme positions for the arms. Post #2 this girl look quite terrific with blue hair ! Good job. Show us a render of her feet (if you have done modelling her feet/boots, heh). I’ve known about shape keys, but I just discovered shape key drivers which is what I really wanted. 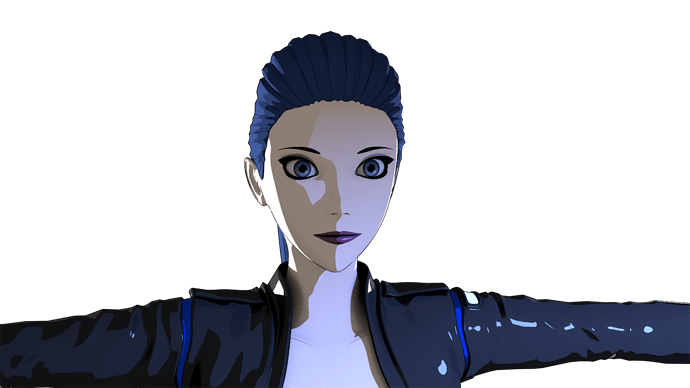 Not sure if I should feel dumb as I’ve solved my weight paint issue with my model, now her shoulders look fine in all realistic angles I pose them in. Thanks. I’ve mostly posted images with the jacket but wanted to post the actual dress that goes under it, in fact as I remodeled the entire thing from scratch, I’m also re-doing all the clothing as well. 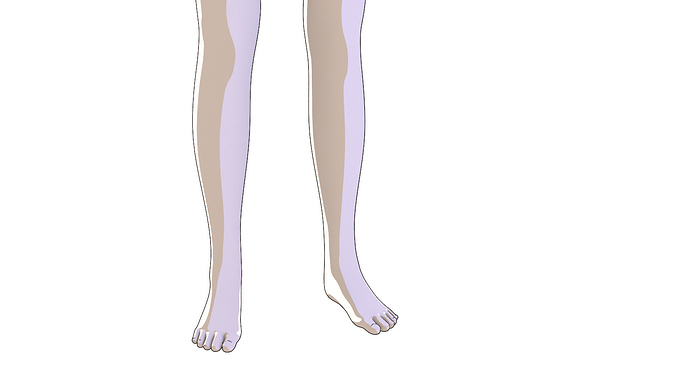 They work much better when copying the weight paint from the model to the new clothes so no more intersecting. Yay! I added some feet pics, I had to say however that modeling the feet was the worst part, so much that I’d rather do weight painting for a living. I just think feet are nasty. A render of the new model and the shoulders working fine after some weeks of weight painting. 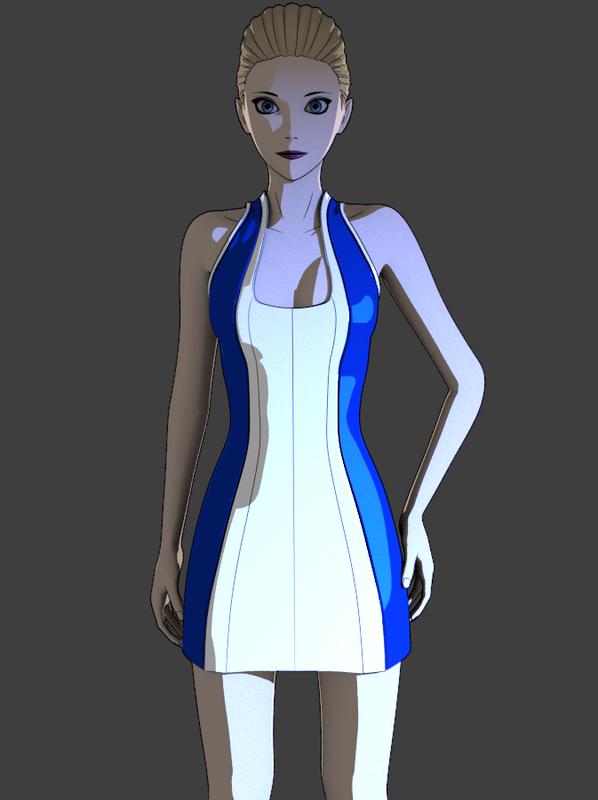 Also includes the new dress part which I am making a bit more form fitting. I also had to increase her breast size because my fiance wouldn’t accept it any smaller. And the bottom area for ren811. I don’t like modeling feet, very difficult. Modeling feet and fingers was the most difficult for me. I ended up using a lot of triangles and some ngons on connecting them, with some throughout the model itself. 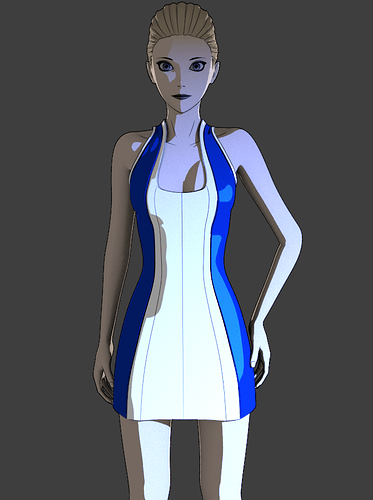 Luckily for what I am doing, those sharp triangle edges don’t really show, so I’m able to get away with a good-enough model that looks much better when rendered as a toon but would probably fail as a realistic render. It’s still pretty amazing. They don’t really look similar, but the boot reminds me of the Long Fall Boot. Did I already say that I’m loving this girl? For the model, are you assigning different materials for the faces, or using a texture? 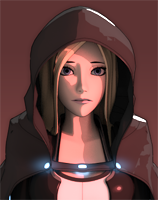 With this work, I really wouldn’t mind seeing a tutorial on how to render characters in this style. 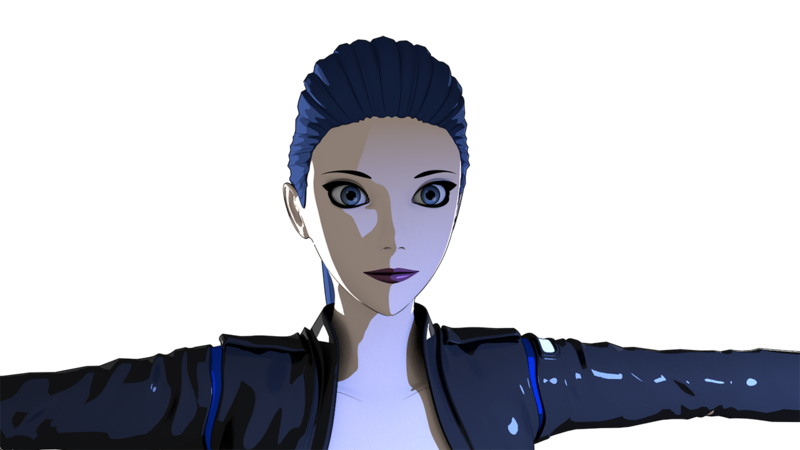 Also, it’s not clear from the first post, but are you going to use her as protagonist for a short film, or render different scenes and put up a comic (I think it would suit this kind of render very well), or maybe other thing? Keep posting the good work! I like this! I am using all materials for the entire model except the eye balls, they have a texture applied to them. I am using the Toon BSDF in Cycles. 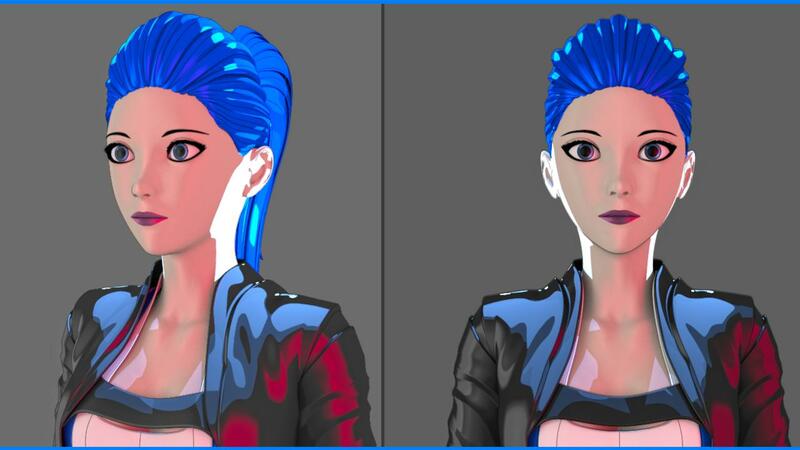 In the more recent pics I added, I started mixing the Toon BSDF with Emission for the skin (made it so it doesn’t illuminate nearby objects). This made it look a lot more toon-like since it wipes out most of the soft shadows, keeping the sharp ones instead. I didn’t follow any specific tutorial to achieve the look, I just messed around with the nodes to create this, based on some help I got from asking on FB or forums. The character is the protagonist for a Sci-fi novel I am writing. 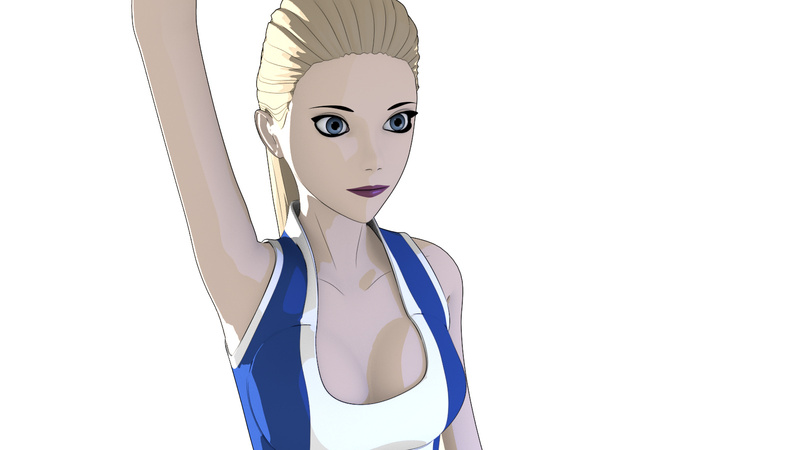 I am considering either making it a graphic novel or just supplementing it with art I create from Blender. I do want to make a small animation, but that’s more of a personal project and not really related to the story; unless I decided to do so. 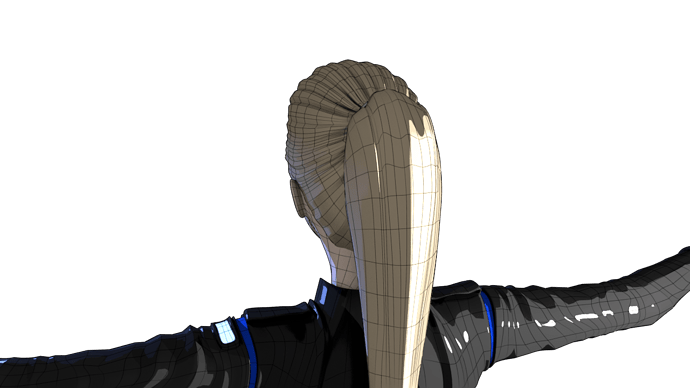 Those lines in her neck are not made up with textures? I’m impressed, lol. I shall try this render style with a character in the near future. All of the lines are done in Freestyle. I used the Mark Freestyle Edge option on her neck, hair strands, clavicles and other small detailed places. I then set them to be finer than the other outlines. For the duration of learning Blender, I didn’t know how to apply any textures, I got fed up with all the tutorials failing, so I just worked the materials and Freestyle to get the results I wanted. 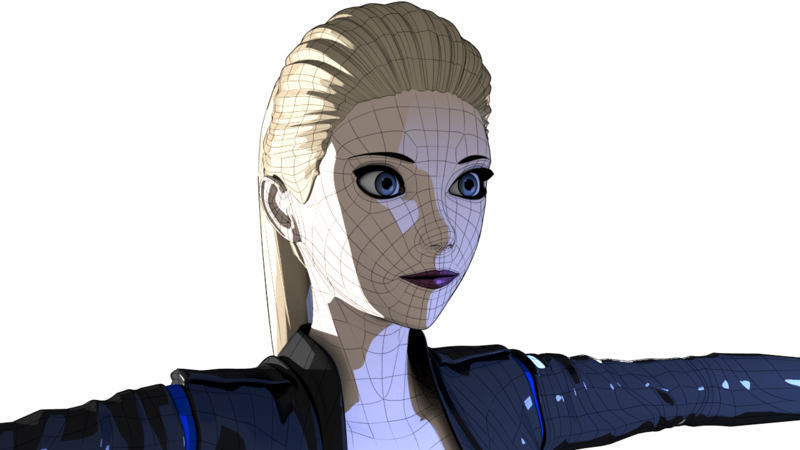 Only just weeks ago I learn how to get the textures to work, which I then used them for the eyes. Probably could have saved a lot of time overall, but I’m happy where I’m at now.